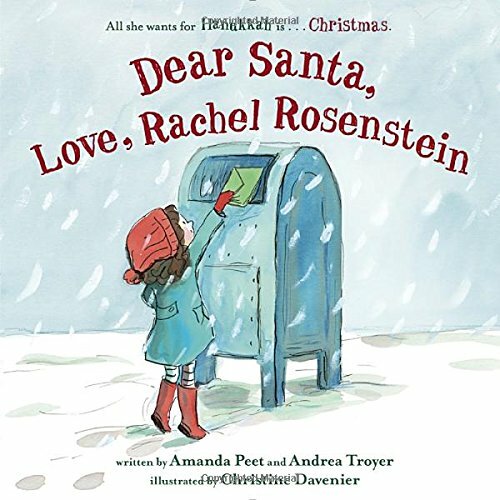 “All she wants for Hanukkah is…Christmas,” reads the tagline on the cover of Dear Santa, Love, Rachel Rosenstein. It seems that Rachel loves all the colorful decorations — she’s seen looking fondly back at them as her mother drags her by the hand. And of course, everyone on her block celebrates Christmas — except Rachel’s family. So one night Rachel writes a secret letter to Santa, promising cookies if he comes down her chimney (and pointing out she’s been good all year). “The Rosensteins were ready for Christmas,” the narrator writes, and Rachel anxiously stays up late, “listening for the clip-clop of Santa’s reindeer on the roof.” But will Santa make an appearance? I hope this isn’t a spoiler, but the answer is…. no. The next morning her father takes Rachel, who’s very disappointed, to an empty park drawn with bare, twiggy trees and covered with snow.